Release of Carmella Van Vleet’s Latest Book! The MiGs have more great news! 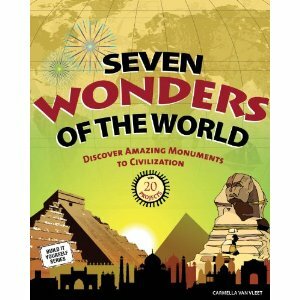 We are thrilled to announce that Carmella Van Vleet’s latest book, Seven Wonders of the World: Discover Amazing Monuments to Civilization has been released! We know you want to hear all the juicy details on how this book came into creation from Carmella herself. And she has offered to answer the MiGs’ questions as well as give away an autographed copy of her book! Andrea: What did you like most about writing your book? And what was the most challenging part of the process? Car: I love doing research. I would find one cool piece of information and it led me to something else. (I’m easily distracted!) It was the thrill of discovery. The most challenging part of the process - besides the 2 year wait between submission and publication - was the seemingly endless job of checking facts. When you’re writing a kids’ book, you’ve got a responsibility to get it right. Christy (eating peppermint patties): If you could visit only one of the monuments in your book, which one would it be? Car: The Great Pyramid. It looks seriously impressive. In one of my earlier books on ancient Egypt, I included a scale model project of the Great Pyramid. I have my own wooden version that I take to classroom visits and kids are in awe when I tell them it would take one MILLION of my models just to fit on the *base* of the Great Pyramid. 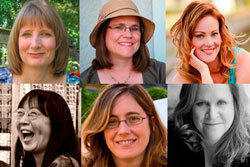 Debbie: How did your Seven Wonders project get started? Car: I had written numerous books for my publisher (Nomad Press) and they asked if I’d be interested in writing one on the Seven Wonders. I knew about a few of the wonders already because they were in my other books, so I thought the project would be a fun way to expand on that research. What's next up on your writing plate? Car: I am taking a break from non-fiction to concentrate on middle grade and young adult. I’ve written two books and just started a third. These days, I’m revising my MG for a couple of agents who are interested in it. What was one of your favorite moments in researching/writing your Wonders book? Car: Hmmm. How about I tell you one of my favorite things about the final project? (Besides the cover!) When I was writing this book, I had trouble pronouncing all the names and places. I decided that if I was having trouble then kids would struggle too, so I did something new for me and included pronunciations. I was delighted to see the publisher kept these in. Car: The very first thing I did was make an outline. It was quite basic: chapter title and craft idea. (The activities often changed, however.) Next, I created a timeline. I spent about a week-and-a-half working on each chapter. The first part of the week was spent researching. The second part was spent writing. The following week I’d work the accompanying project and start researching for the next chapter and so on. Some chapters, of course, took longer to complete. But I tried hard to keep on schedule so I didn’t get overwhelmed. Kate: What skill from writing non-fiction do you carry over most into your fiction writing? Car: This is a really tough question. Writing fiction is a whole new ball game for me. The process is completely different. For instance, I need a lot more time to think through things before I commit words to paper. My timeline has gone out window! However, I think my ability to remain calm has carried over from non-fiction to fiction. What I mean is this: when you’re starting a new project and you know you have to produce 30,000+ words, it’s very easy to freak out. You start asking yourself things like “Am I crazy?” and “How will I ever get this done?” I got around this before by concentrating on one chapter at a time. I do the same thing now - One. Scene. At. A. Time. Any favorite music when you're writing? I love to listen to Brother Iz (Israel Kamakawiwo’ole). He was this amazing Hawaiian singer whose beautiful voice makes me cry. What kind of chocolate do you prefer: dark or milk? Dark if I’m eating it by itself. Semi-sweet if it’s going in cookies. What was the last thing you finished reading? Does the newspaper count? :-) I tend to read in spurts. That’s because when I’m working on my own project, I have trouble reading fiction. I either start borrowing the author’s voice or get swept up and don’t want to work. The last book I read, though, was “Before I Fall” by Lauren Oliver. Thank you so much Carmella! To enter the contest to win an autographed copy of Seven Wonders of the World: Amazing Monuments to Civilizations, fill out the form below and answer the question in the box provided.